Don't you just love when a dress comes together? And how about when two dresses come together. Today's blog post features my own self drafted dress and an infant dress using New Look 6576 by Simplicity. First, let me say that I am so excited that I finally have a basic bodice sloper in my pattern stash. I signed up for MimiG's sew it academy for the bodice and skirt sloper courses. All of the courses in the academy are great, but to be honest, I was only interested in the sloper courses. I do, however, intend to continue my membership because I want to try the more advanced courses she will be releasing this fall. Oddly enough it took me forever to complete the bodice sloper course because I continued to distract myself with commercial patterns in my pattern stash. Creating the skirt sloper was pretty easy but the bodice sloper gave me the blues. My first few muslins didn't fit in the shoulder area. Fixing the shoulder seam problem led to gaping in the chest and armhole area. And after I fixed the gaping I had to do a FBA. All of those modifications (and muslins) were worth it though because it led to this dress. Nevertheless, I still have a few things I want to fix regarding the bust dart, armhole, and the lower side seams. All in all, I am very excited that I have basic slopers because I know the possibilities to create will be endless. 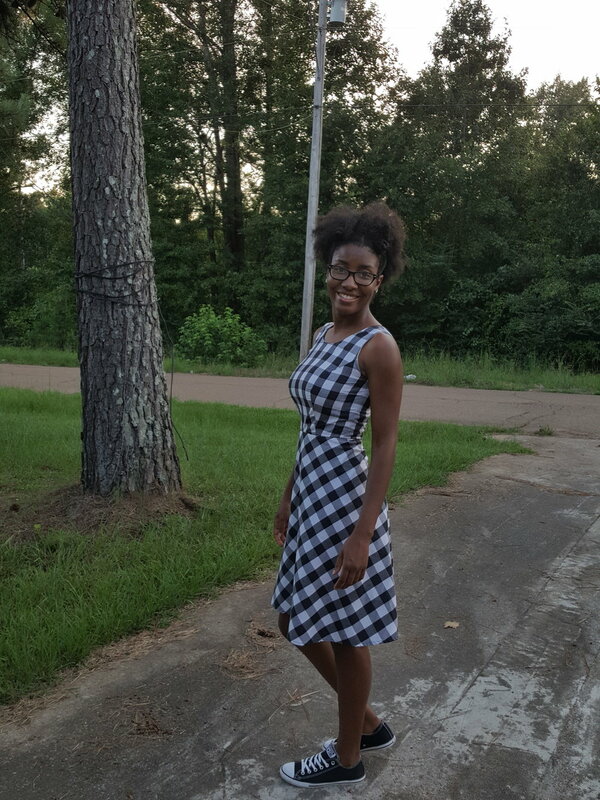 After I finished my dress I had plenty of fabric leftover to try out New Look 6576 for my niece, and I wrote a pattern review that you can read below. This pattern is easy and it only took me two hours to cut and sew this dress up so it is definitely on my list of favorite patterns for her. There are plenty of pictures below of her sporting this simple look, enjoy! Infant dress with flare bottom and button shoulder closure. Pattern also contains appliqué templates as an option to add additional details to the dress. Newborn to Large, JJ typically wears size 12 – 18 months. I traced the size medium. Did it look like the photo/drawing on the pattern envelop once you were done sewing with it? Yes, it did but I did not do any appliqué because it was unnecessary with the gingham print. The instructions were simple but I don’t know about easy to follow. Easy does not necessarily mean beginner friendly. I think this is great for someone with a little experience because the instructions lacked important details to me. There were very few pieces to cut and sew up. Also does not take a lot of fabric to make one of these. I did not interface the facings. I brought the button down about half an inch. Yes! It is a quick and simple sew. I love that this is a summer dress that can also be paired with a shirt and tights for fall weather. Yes, she decided to get out and push her own stroller.